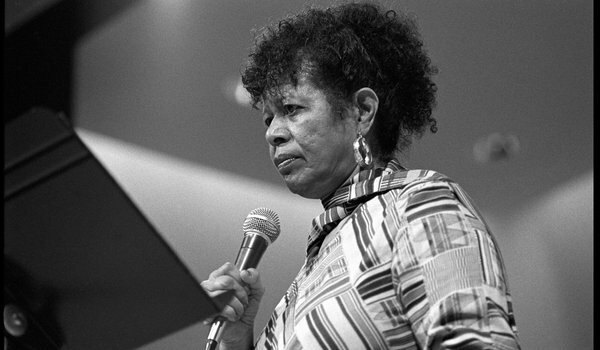 Jayne Cortez was born on May 10, 1934 on the Fort Huachuca, Arizona Army base, the daughter of a career soldier who served in both world wars. At 7, Cortez and her family moved to Los Angeles, where she grew up in the Black Watts district of the city. Loving jazz and Latin recordings, Cortez studied art, music, and drama, attending Compton Community College after high school. As she began her career in poetry, Jayne took on the name of her maternal grandmother. Inspired, as she chose to describe it, by Black writers Langston Hughes, Aimé Césaire, Léon Damas, Christopher Okigbo, Henry Dumas, Amiri Baraka, and Richard Wright, Cortez also derived performative influences by Bessie Smith, and numerous other jazz performers. Her own poetry is, in fact, jazz inspired, and her words, while written, were often chanted, and spoken in rhythmic repetition that resembled the intricate, tactile language of African and Caribbean drumming. Her first book, Pissstained Stairs and the Monkey Man's Wares, was published in 1969 by Phrase Text, and her next four books were published by the press she established, Bola. As she as written of her own poetic writing: “I use dreams, the subconscious and the real objects, and I open up the body and use organs, and I sink them into words. I guess the poetry is like a festival. Everything can be transformed. In 1954, Cortez married jazz performer, Ornette Coleman, a marriage which produced now jazz drummer, Denardo Coleman. They divorced in 1964. In 1975, Cortez married painter, sculptor, and printmaker Melvin Edwards. His work has appeared in her publications as well as on some of her album covers. In 1991, along with Ghanaian writer Ama Ata Aidoo, Cortez founded the Organization of Women Writers of Africa (OWWA), of which she was president. She was organizer of "Slave Routes: The Long Memory" (2000) and "Yari Yari Pamberi: Black Women Writers Dissecting Globalization" (2004), both international conferences held at New York University. She appeared on screen in the films Women In Jazz and Poetry in Motion. Ms. Cortez also directed Yari Yari: Black Women Writers and the Future (1999), which documented panels, readings and performances held during the first major international literary conference on women of African descent. She also founded the Watts Repertory Theater Company, a group focused on revealing racial equalities. Cortez split her time between Los Angeles and Dakar, Senegal, where she, she claimed, she felt most at home. She died in New York City on December 28, 2012 of heart failure.